The Sanuki Takamatsu Festival Fireworks are worth the wait! Recently there are many people from all over the world visiting Kagawa. If you ask them why they decided to come to Kagawa, many tourists say that they like Kagawa because it’s off the beaten path. At Step by Step Eikaiwa, we’ve met many international tourists, and many times they ask us for our recommended Kagawa tourism spots. There are many famous places for sightseeing such as Ritsurin Garden, Marugame Castle, Yashima, Konpira Temple, and more. In this blog series called “Recommended Kagawa Tourism Spots,” we want to introduce some exciting places and events that you can recommend to international visitors. Today’s recommended Kagawa tourism spot is the Sanuki Takamatsu Festival Fireworks at Sunport in Takamatsu City. Unfortunately, this event is only held once a year, so it’s a good recommendation for summer visitors. Of course, there are many other festivals and fireworks displays in Kagawa, but the Sanuki Takamatsu Festival Fireworks are the biggest and the best. This year’s Sanuki Takamatsu Festival Fireworks were especially exciting. There were 8,888 fireworks launched into the clear night sky. Many people who visit Kagawa from other countries enjoy wearing traditional summer outfits such as Yukatas. Enjoying many different kinds of food, drinks, and games is also something everyone should experience. If you have a chance to visit Kagawa or offer some recommendations for sightseeing spots, don’t forget to mention the Sanuki Takamatsu Festival Fireworks. For more information about fireworks schedules in Kagawa, please check out the Takamatsu City website, or the takamatsulife.com website. All of the photos in this post were taken at the 2017 Sanuki Takamatsu Festival Fireworks. As a part of the “My Little Kagawa” project, I have decided to expand the project to include other aspects of Kagawa culture and events photographed from a Cessna airplane. The continuation of this project is possible thanks to the generous support of Mr. Kimura and Mr. Kodama. 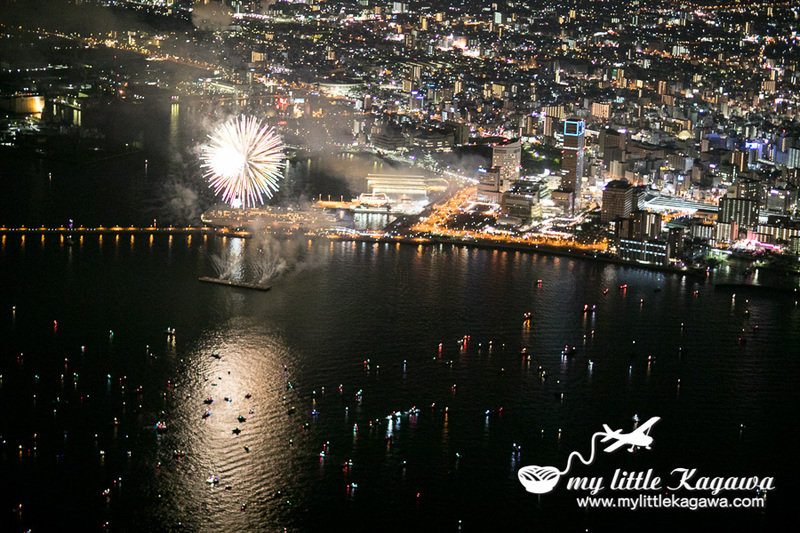 The photos from this year’s flight during the Takamatsu Firework display were impressive. Compared with our flight two years ago in the rain, this year was much easier to get great photos. The air was clear and the flight was smooth. I’m looking forward to getting more great shots of other events to show how great Kagawa is. Since the next firework display isn’t until next year, check back soon to see our next Kagawa Recommended Spot!